We implemented online analytics for the leading ecommerce projects that generate 1 000 000 transactions every week. Among our clients there are projects from different countries: USA, Switzerland, Russia, Czech Republic, Ukraine. We possess profound understanding of retailers’ goals. We have developed unique custom attribution models and solutions for a number of typical retailers’ tasks. 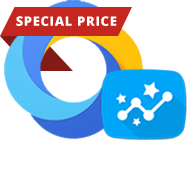 OWOX is a Google Cloud Platform Authorized Technology Partner and Google Analytics 360 Authorized Reseller. We co-organize GoAnalytics conferences. Our analysts have become recognized experts in the market and make reports at professional conferences. We aim at sharing competence with your team. That is for we conduct corporate training sessions and professional seminars for your technical specialists. We offer not only technical support for Google Analytics 360 usage, but also individual set of metrics development and consultancy on solving non-typical tasks. We are fully behind tracking tags management on your website. You do not have to involve additional specialists and spend additional resources. Our competence and Google Tag Manager advantages let us achieve the most of your business tasks without involving developers and making changes to the code. Funnel Based Attribution determines the value of each user session based on the probability that the buyer will move onto the next step of the sales funnel and provides you with the full access to this data in Google BigQuery. Allows to calculate ROI for all the campaigns and increase their effectiveness. Allows to conduct ad-hoc analysis based on Google BigQuery data and visualize them without additional paid services. Lets you get unsampled data in real-time and allows to conduct integration with CRM and ERP used in your company. Google BigQuery to Google Analytics Data Import pipeline automatically imports your query results from Google BigQuery into Google Analytics. Google Sheets Upload Add-on for Google Sheets automatically verifies your data format and sends it to Google Analytics Data Import. We are not an agency and are not interested to allocate your budget for campaigns. Our only goal is to provide you with the true data for taking right decisions.